My body position over the Bear's Brow jump actually makes it look like I attend yoga classes every so often. Videos from our 2014 campaign are posted in the homepage. Videos and images from previous seasons are on the Videos/Photos Tab. Even if you know all about ski racing, please check out the Ski Racing 101 tab. Not only is there basic info on ski racing, there is info on the various types of Adaptive racing, new v. the old ski racing technique and some info on racing behind a guide. 2010 Paralympic Downhill, Whistler, BC, Canada. My run begins at 2:09:02 but I would suggest you start 30 seconds or so earlier and you’ll see a pattern amongst the visually impaired racers in the finish. Panorama, BC, Canada, January 2014. We were fortunate to win this downhill. Portion of the race captured on a coach's camera. Panorama, BC, Canada, January 2014. We were fortunate to win this Super-G. Portion of the race captured on a coach's camera. Panorama, BC, Canada, January 2014. We finished second in this giant slalom. Portion of the race captured on a coach's camera. Copper Mountain, CO., January 2014. I, unfortunately, crashed in this GS. Copper Mountain, CO., January 2014. I, unfortunately, crashed in this slalom. World Cup Downhill, March 2, 2010 - Aspen, CO.
Slater and I finished second in this race. This was our first race this season against our international competitors. Our competitors are skiing well and Slater and I will need to ski fast and error free to reach the Paralympic podium in Whistler. Below is footage of Super-G training. Camera was mounted to the top of my boot. We probably hit speeds of 50 to 55 mph. Below is footage of GS training. Camera is mounted on my helmet and shows Slater guiding me down the course. I need to ski faster to keep Slater only a half gate ahead. Reverse helmet camera footage. We were hoping that the helmet camera would provide visuals that help me improve my technique. Camera is a little too unsteady to accomplish this goal as well as we would like. First run from the first race of the year at Copper Mountain on December 14. 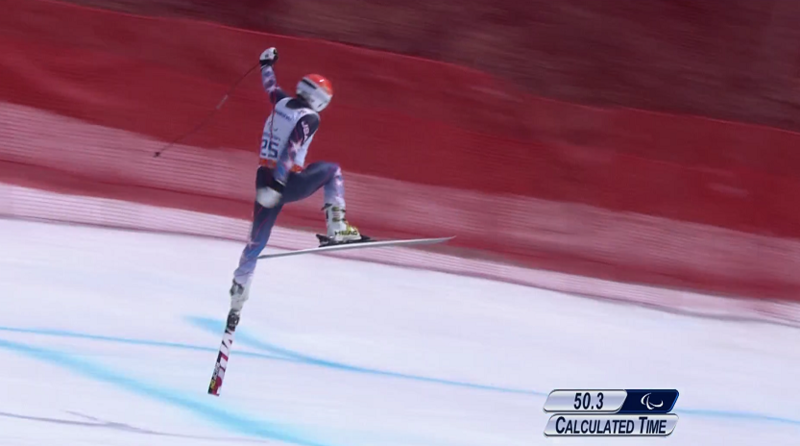 We won this race and skied pretty well but I will need to ski faster and more dynamically in the Paralympics. A key to skiing fast is to follow my guide Slater by approximately half a gate. Our distance was pretty good on this run. Skied one full gate behind Slater and that is too great a distance. Note how I start my turns late and my line is too wide and round. Our primary focus during training will be to learn to keep our distance to half a gate length in Slalom, GS and Super-G. I think the camera added 15 pounds to my bottom. This footage shows the upper portion of the Super G course where we made four turns on a moderately steep face and then had a few turns on the flats leading into a narrow, tricky and fast section. Super G is a speed event and consists of one run. We probably hit speeds of 50 to 55 mph. We won the visually impaired category and probably competed for the fastest overall time. The distance between Slater and I was good and I am pleased with my form on this run. Need to tighten my line and run a cleaner inside ski to be faster. This is the Super G portion of the Super Combined at Winter Park. Footage is from the bottom of the course and my form is breaking and I am scrubbing speed because I am gasping for thin air and because my legs are burning and weak. I need to significantly improve my fitness for the Paralympics. Fortunately, the race at Whistler are held at a lower elevation than the courses in Colorado. We won the visually impaired category and may have won the overall race. My slalom is much improved versus last year but I need to slide my skis less and run over more of the gates. I also reverted to my 1970s technique in too many portions of the course. Slalom is like doing 40 - 60 leg lungs and punches in 60 seconds and it felt like I was breathing napalm just after the halfway point. We won this run but I will need to be much faster in the Paralympics to overcome the handicap awarded to the more visually impaired racers.